Tickets are $129.00, $95.00, $75.00, $65.00 and $55.00 and go on sale Saturday, April 20th at Noon through Ticketmaster. Ticketmaster customers may log on to Ticketmaster.com. Tickets will also be available at the Mohegan Sun Box Office beginning on Sunday, April 21st at 10:00am, subject to availability. The familiar maxim of the triple threat – singer, songwriter, and musician – doesn’t begin to cover it for Toby Keith, one of the modern era’s most complete self-directed hit makers. At the close of 2018, he celebrated the 25th anniversary of his debut #1 single, “Should’ve Been A Cowboy” with the re-release of his debut album (remastered with the addition of three vault tracks), a week of events in Nashville including a BMI event to commemorate the milestone, two shows at the historic Grand Ole Opry, and a performance at the Nashville Symphony Ball where he received the prestigious “Harmony Award.” Keith also released a new song, “Don’t Let The Old Man In,” which was inspired by a conversation he had with Clint Eastwood and was later featured in Eastwood’s movie, The Mule. Rounding out the year full of music-related accomplishments was his 15th Annual Toby Keith & Friends Golf Classic, which raised more than $1 million, bringing the annual event’s total funds raised to $12.4 million. The funds support the charitable endeavors of The Toby Keith Foundation which includes aiding sick children and their families in Oklahoma. Toby also honored the 25th anniversary of the release of his debut single with his aptly-named tour “Should’ve Been A Cowboy XXV Tour.” From the moment that song was released and shot up the charts to become his first #1, the engine driving everything has been the music. He writes it. He arranges and produces it. And he releases it on his own record label, Show Dog Nashville. At the core is his songwriting, as recognized in his 2015 induction into the Songwriters Hall Of Fame in New York City. The Nashville Songwriters Association International named him “Songwriter/Artist of the Decade” and he is a three-time BMI Country “Songwriter/Artist of the Year.” His songs have received more than 92 million BMI performances on commercial radio stations worldwide, making him the organization’s top Country songwriter in terrestrial Country radio. Outside of music, his successes carry through to business endeavors including Wild Shot, his premium mezcal liquor products, and I Love This Bar and Grill restaurants including the original location which has been operating for more than a decade on the famed Las Vegas Strip. Toby’s most rewarding experiences, however, have come from giving back locally, nationally and abroad. His golf classics fund The Toby Keith Foundation 2 and OK Kids Korral, a cost-free home for families of children dealing with critical illnesses. His 11 USO Tours to date have enhanced the lives of nearly 256,000 troops and military families in 18 countries with more than 285 events, and have been recognized with the “Spirit of the USO Award” (2014). Many songs Keith has written while on the USO Tours for the military are featured on his 2017 album The Bus Songs, a 12-song collection of humorous, just-for-fun compositions that set a Billboard Comedy Albums chart record for a Country artist by holding the #1 spot for 11 consecutive weeks. 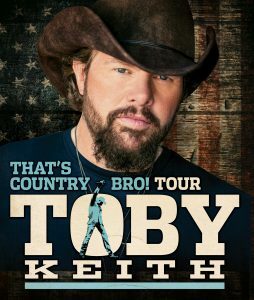 And when a tornado ravaged his hometown, Toby Keith was the face of the community and helped shoulder the cleanup with the 2013 OK Twister Relief Concert. Triple threat? How about singer, songwriter, musician, producer, entertainer, humanitarian, Oklahoman and patriot.